CINEMA 4D Broadcast heeft alles in huis om snel en gemakkelijk dynamische broadcast graphics te creëren. Als u een motion graphics professional bent en u wilt 3D toevoegen aan uw bestaande toolset, dan is CINEMA 4D Broadcast de ideale oplossing voor u.
Naast de functies die in CINEMA 4D Prime zitten bevat CINEMA 4D Broadcast extra tools die het vervaardigen van motion graphics vergemakkelijken, zoals de toonaangevende cloning tool. Geavanceerd renderen is mogelijk door o.a. Global Illumination. Verder wordt met het pakket een high-end bibliotheek geleverd vol met 3D modellen, camera's, setups voor verlichting, video clips en veel meer. Als u vertrouwd bent met 2D motion graphics software begint u al met een voorsprong. CINEMA 4D Broadcast heeft namelijk veel weg van de interface van een 2D compositing pakket. U zult als 2D compositor vrij snel CINEMA 4D Broadcast onder de knie krijgen. CINEMA 4D heeft een krachtige exportoptie die u in staat stelt om een 3D beeld in aparte lagen te exporteren naar de meest populaire compositing programma's, zoals After Effects, Motion, Final Cut Pro, en anderen. Door de vele opties die u met dit mult-layer beeld heeft, heeft u volledige controle over de beelden en animaties die u exporteert. Dit en nog veel meer maakt CINEMA 4D Broadcast de eerste keuze voor 3D motion graphics professionals. 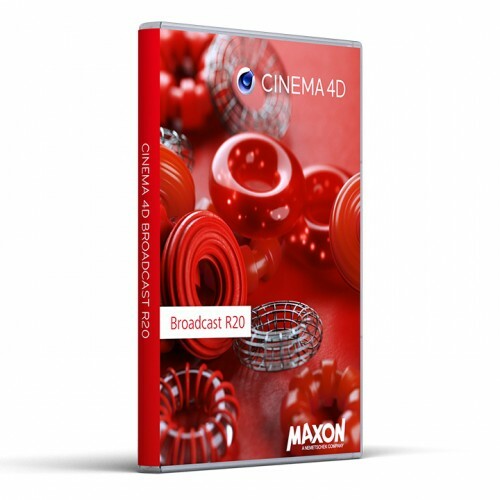 CINEMA 4D Broadcast has everything you need to create dynamic broadcast graphics quickly and easily. If you are a motion graphics artist looking to add 3D to your existing suite of tools, then this is the ideal choice for you. CINEMA 4D Broadcast contains all the features of CINEMA 4D Prime as well as specific tools for creating motion graphics, including industry-leading cloning tools, advanced rendering options such as Global Illumination, a high-end library packed with 3D models, cameras, lighting setups, video clips, and much more. If you are already familiar with 2D motion graphics software you already have an advantage! CINEMA 4D Broadcast contains many common elements - and that flattens the learning curve! CINEMA 4D's powerful export options allow multi-layer image export directly into popular compositing software such as After Effects, Motion, Final Cut Pro, Combustion and others. The huge array of options let you have complete control over the images and animations you export. This and so much more makes CINEMA 4D Broadcast the first choice for professional 3D motion graphics.